Pip grows rounder, stronger, and more capable of catching tiny sea creatures daily. We love watching the development of his wings especially. Soon his flying feathers will begin to grow. In the meanwhile, periodically throughout the day he does wonderfully zany-looking zing-zang-up-down-sideways-zig-zag mini flight tests throughout the day. 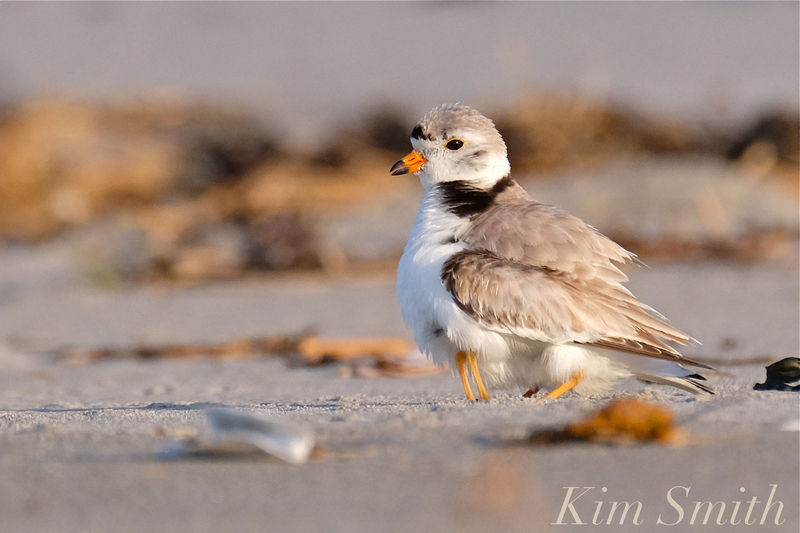 The Piping Plover’s soft sandy feather colors and patterns blend seamlessly with the surrounding beach habitat, but camouflage alone is not enough to keep the birds safe. 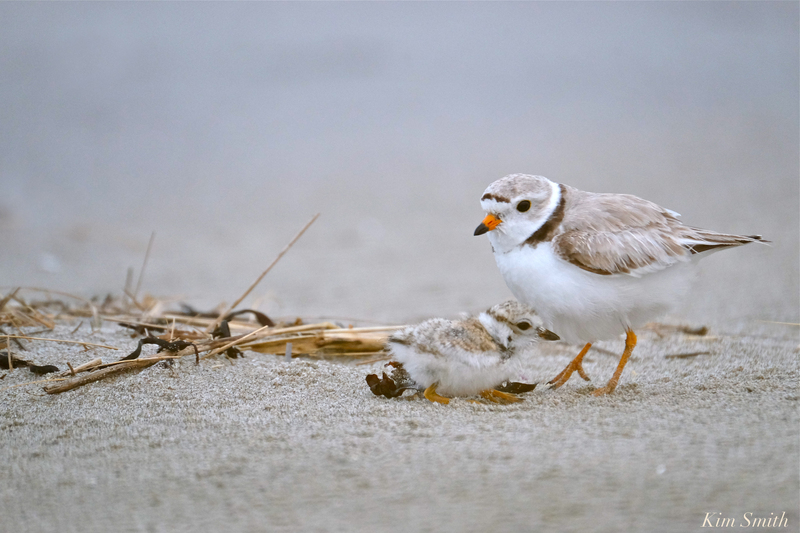 The ability to fly to escape predatory danger is equally as important to Piping Plovers. 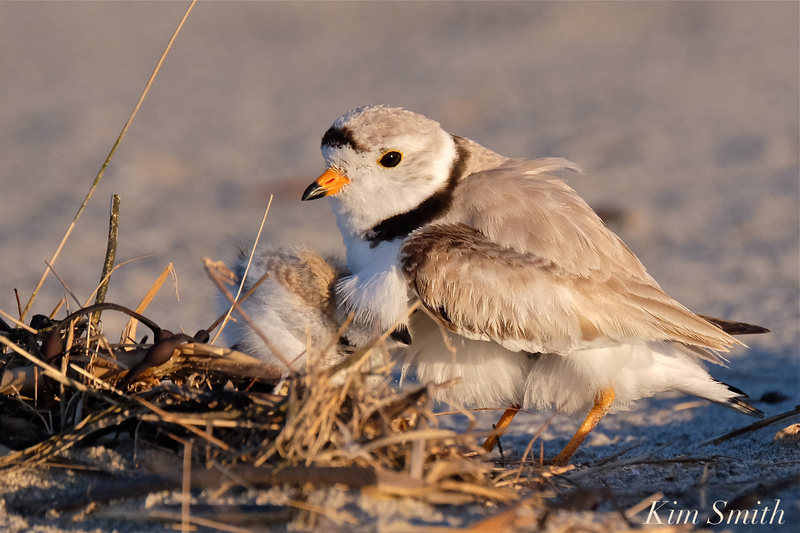 Massachusetts state wildlife biologists consider a Piping Plover fully fledged at 24 to 28 days, whereas federal wildlife biologists have determined a Piping Plover chick to be fully fledged at about 35 days. 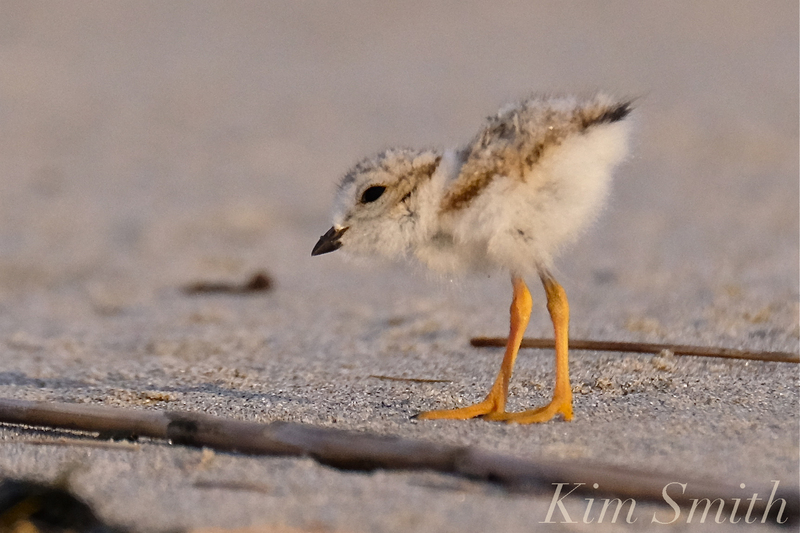 Judging from our observations of Little Chick last year, he did not fully fledge until five weeks old (35 days). He could manage brief sustained flight up to that time, but until he reached that five week milestone he was still at risk from predators, including and especially dogs and raptors. Seventeen-day-old Pip needed lots of warming snuggles on this chilly Tuesday morning. 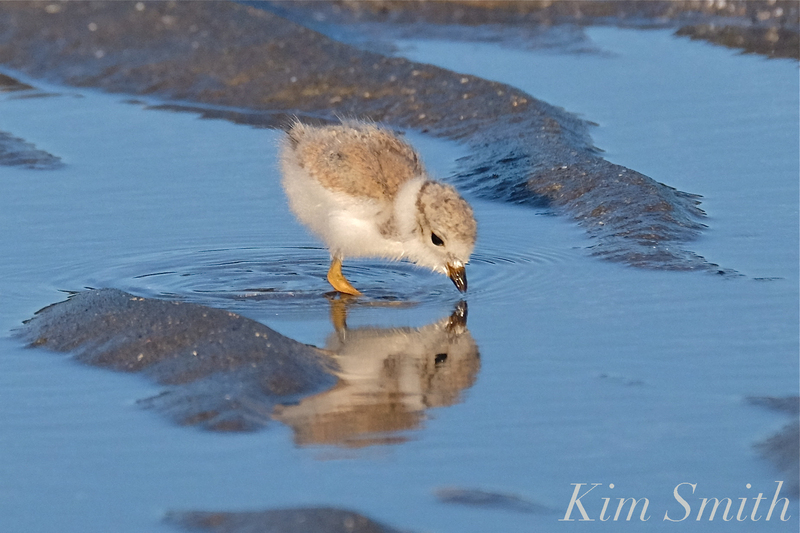 This entry was posted in Birds, Birds of New England, Cape Ann Wildlife, Gloucester Plover, Life at the Edge of the Sea, Piping Plover and tagged #SavetheShore, #shorebirdsgoingextinct, 17 day old piping plover chick, Beautiful Birds of Cape Ann, Charadrius melodus, Gloucester, Gloucester Plover, Gloucester Plovers, Good Harbor Beach, how you can help the plovers, kwhittaker@gloucester-ma.gov, parking lot plovers, Piping Plover on June 26, 2018 by Kim Smith. HAPPY TWO-WEEK-OLD BIRTHDAY TO OUR LITTLE PIP! 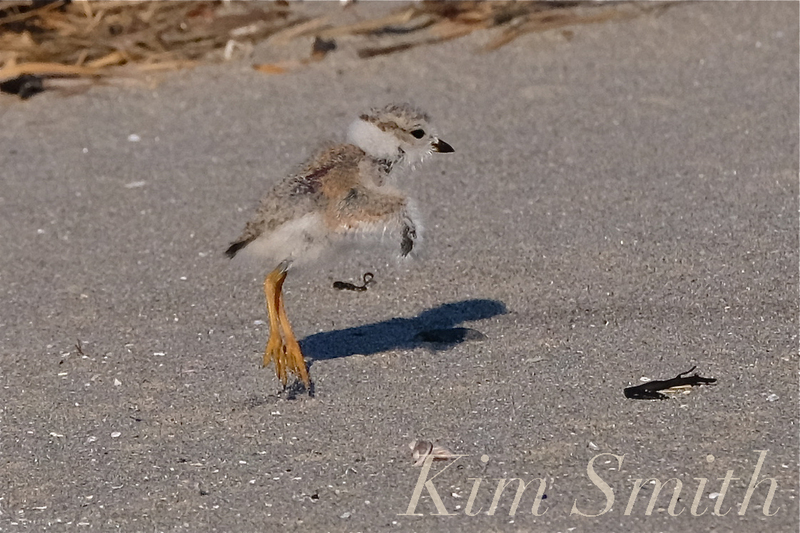 Our Good Harbor Beach Piping Plover Little Pip made the two-week-old milestone on Saturday!!! 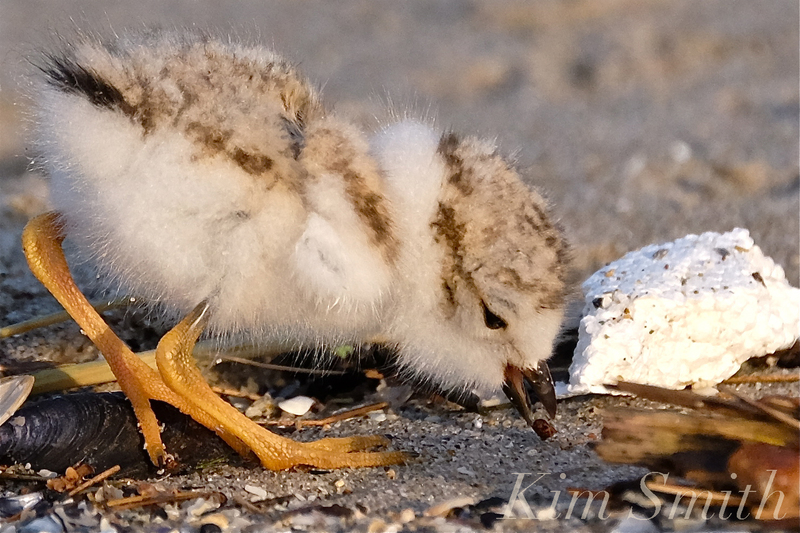 To survive two whole weeks is an important date for a Piping Plover chick. Pip’s chance of fledging has improved exponentially. Every day he grows a little stronger, a bit taller and rounder, and noticeably faster. Less sleepy-eyed when waking up from snuggling under Mom or Dad, out he zooms from the warm wing of the parents like a jet-propelled rocket. And now he does this fascinating thing with his wings. Just as did Little Chick last year, at top speed, he zings and zangs with wings aflutter and aflap, seeming airborne for a few seconds. He won’t be able to sustain flight for another several weeks, but won’t it be marvelous when he does! 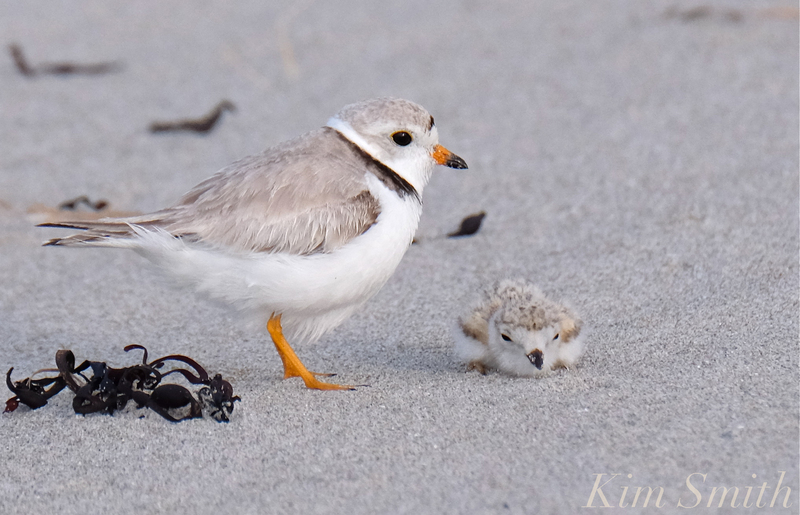 Piping Plover chicks and parents communicate with a wide range of piping calls. We are more likely to hear Mama and Papa’s shrill, urgent notes warning of pending danger. 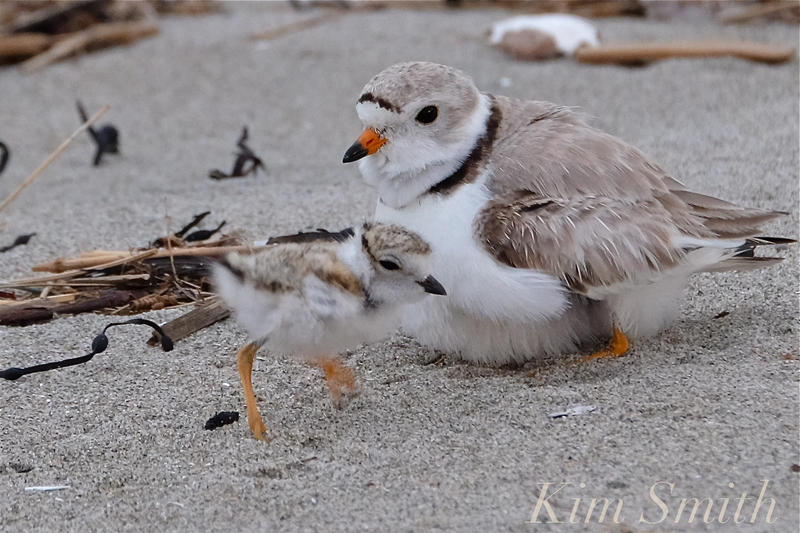 But more often, both chicks and parents communicate in soft, barely audible gentle notes. At about twelve days old, our Little Pip appeared to understand, and respond more quickly, to the piping calls of the parent’s commands. 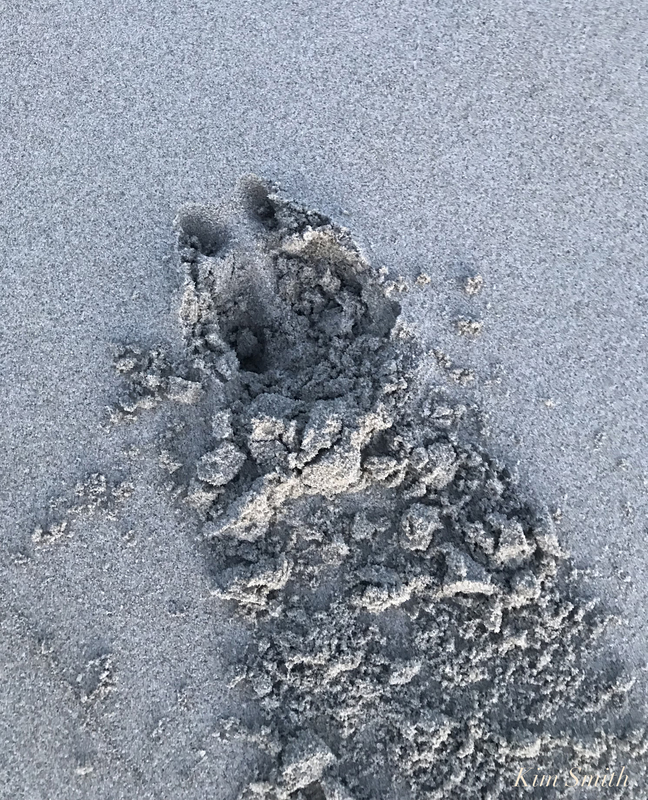 He now flattens level with the sand when Mama and Papa pipe danger notes, or when a predatory bird flies overhead. Dip-diving in the tide pools for breakfast! This insect was so large, from a distance I at first thought Pip was eating seaweed. He swallowed the bug in one gulp! Pip continues to snuggle under wing, but will do so less and less frequently as he develops and is better able to thermoregulate. 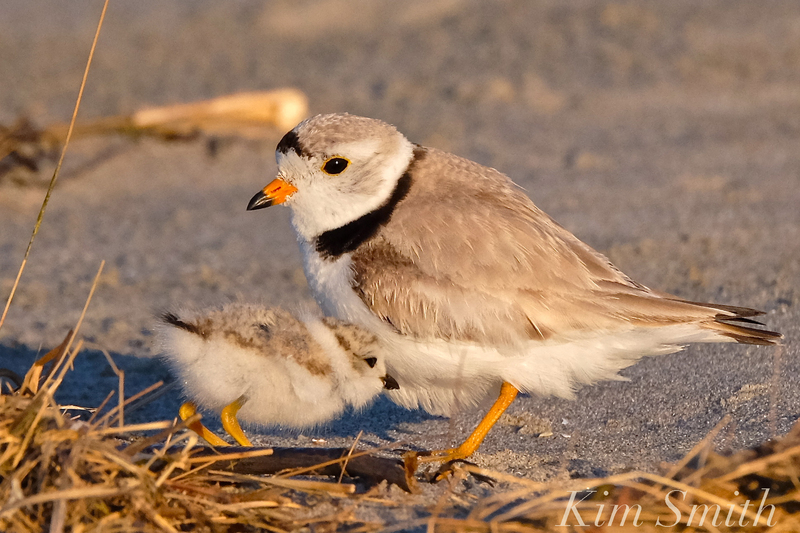 I recall our Little Chick last summer attempting to snuggle under Papa Plover even at thirty-days-old, which by the way, looked terribly silly, but sweet, to see a chick nearly as large as the parent try to snuggle under its wing. 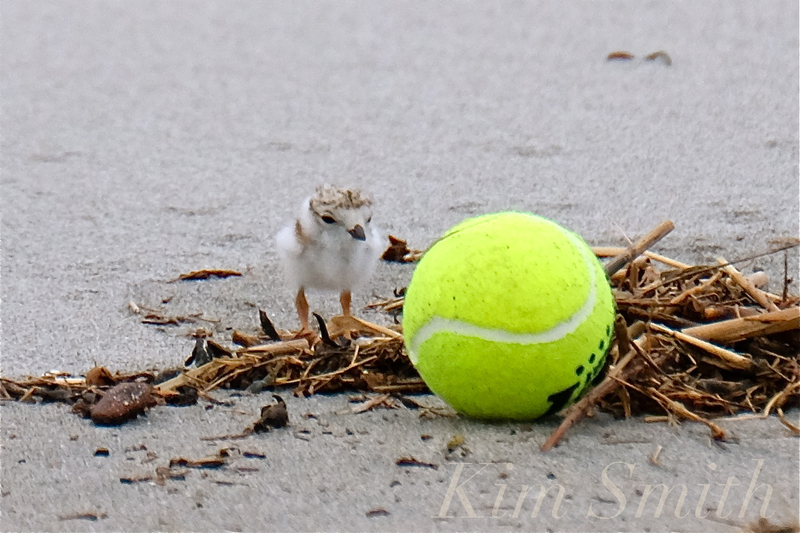 Two weeks ago Saturday, our lone surviving chick hatched in the parking lot at Good Harbor Beach. Despite being driven off the beach by dogs running through the nesting area (sadly finding the lot to be the least dangerous place to nest), Mama and Papa PiPl successfully hatched four chicks from four eggs. This would not have been possible without a whole lot of help from Gloucester’s DPW, Essex County Greenbelt’s Dave Rimmer, Gloucester’s conservation agent Ken Whittaker, and a core group of super dedicated volunteers. 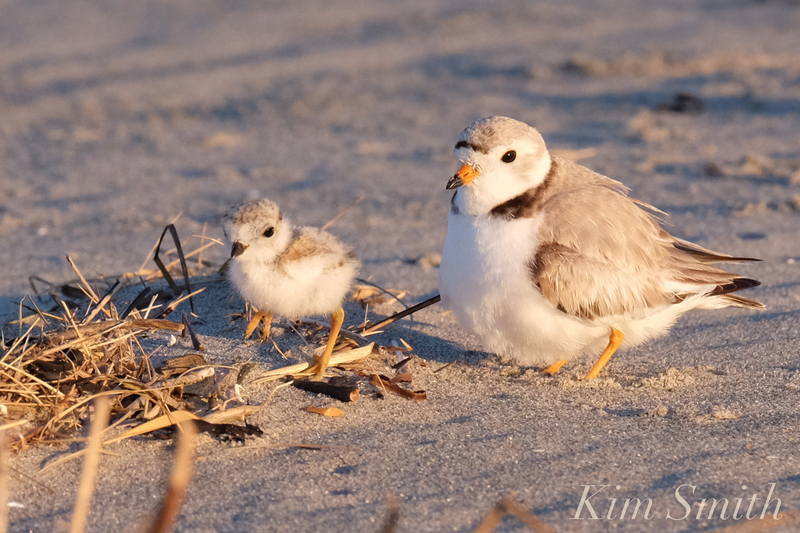 After spending the first day in the parking lot, the family of six–Mama, Papa, and four one-day-old chicks made the epic journey across the width of the parking lot, through the landscape of tall dune grass, tumbling down the steep slope of the dune, and into the roped off nesting area. Had Papa and Mama pre-planned this route? I think yes. 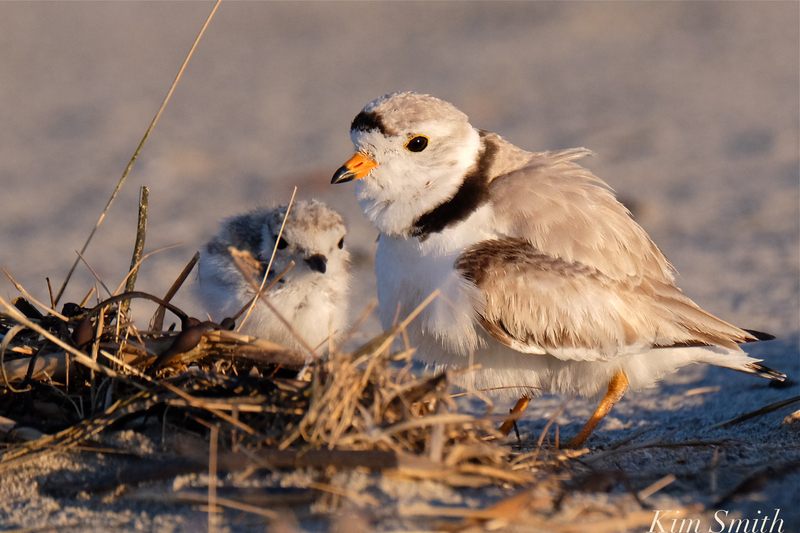 Life for a Piping Plover chick, especially at Gloucester’s most well-loved and highly trafficked of beaches, is impossibly tough. The first chick to perish was eaten by a gull, the second was taken out by a dog off leash in the nesting area, and the third, by a crow. 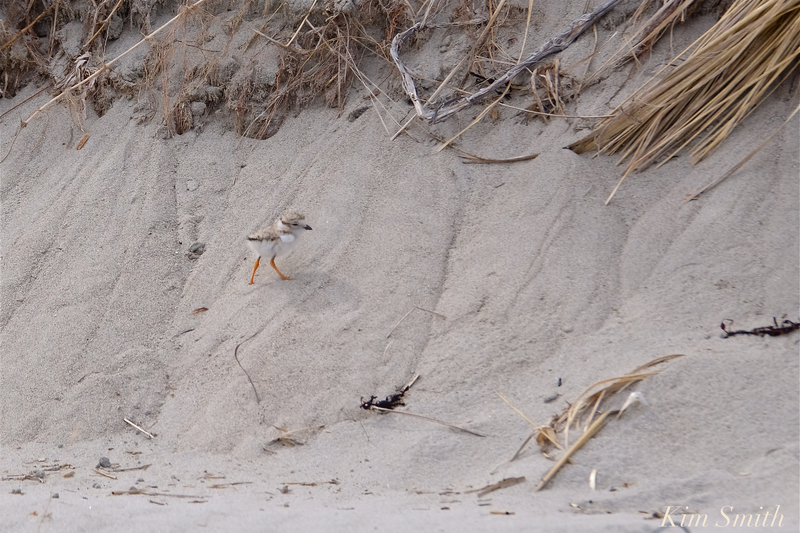 In one way or another, the trail as to why these tender little shorebirds perished leads to the heavy footprint left by people. 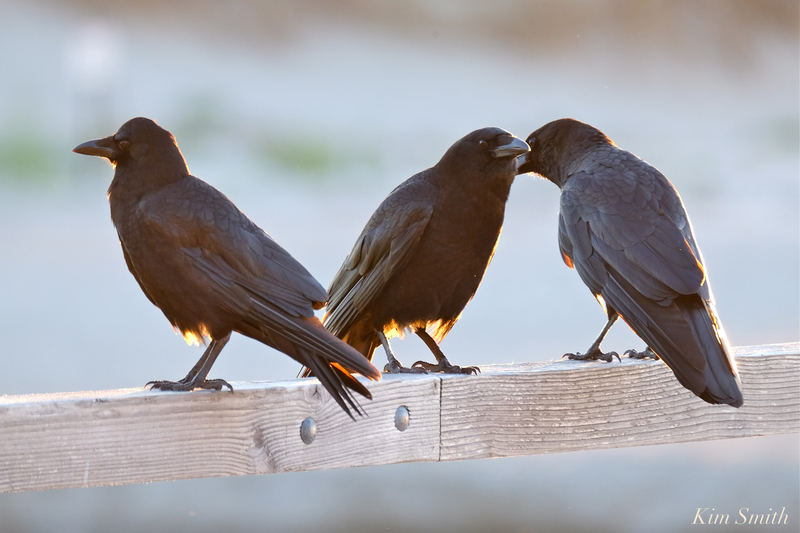 Morning meet and greet of the Crow Breakfast Club, held every day on Nautilus Road following a warm sunny beach day. Gloucester does not have a seagull and crow problem, but we do have a littering, as well as a lack of trash barrels problem. 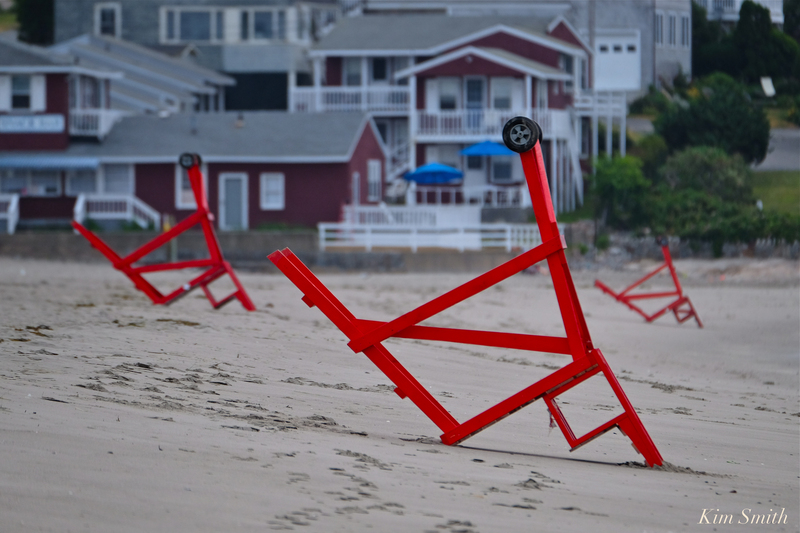 If the crows and gulls were not finding the mounds of trash littering the beach, and piled at the entryways to the beach, each and every single morning, they would simply find somewhere else to forage. 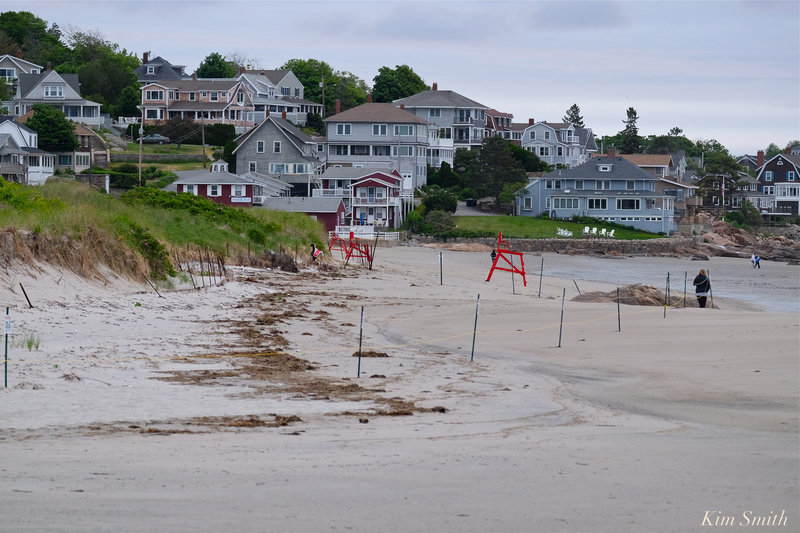 Bright and early, every morning the DPW crews arrive to clean the beach, but what happens before they arrive? 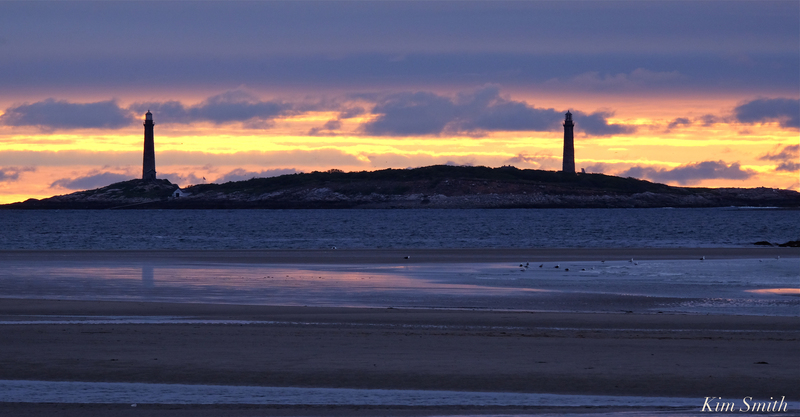 For the first three hours of daylight, the crows and gulls devour a smorgasbord of tantalizing treats, feasting on loose garbage strewn the entire length of the beach, in the parking lot, and at all the entrances to the beach. Forget placing the garbage in bags if the bags are not contained in barrels; the birds, rats, and coyotes knowingly rip right through them. The plastic cups, bottles, to-go containers, and accoutrements blow freely through the dunes and marsh and eventually, all is carried into the ocean. The trash problem holds true throughout the city. If folks stopped feeding the crows and gulls, and we solve the garbage problem, we will rid ourselves of ninety percent of the issues surrounding gulls, crows, coyotes, and rats. Carry in, carry out works to a degree, but barrels are sorely needed at locations such as the entrance to the footbridge. Additionally, residents would ideally place their garbage, in barrels, the morning of trash collection (as opposed the the night before), dumpsters always kept tightly covered, and littering laws strictly enforced. 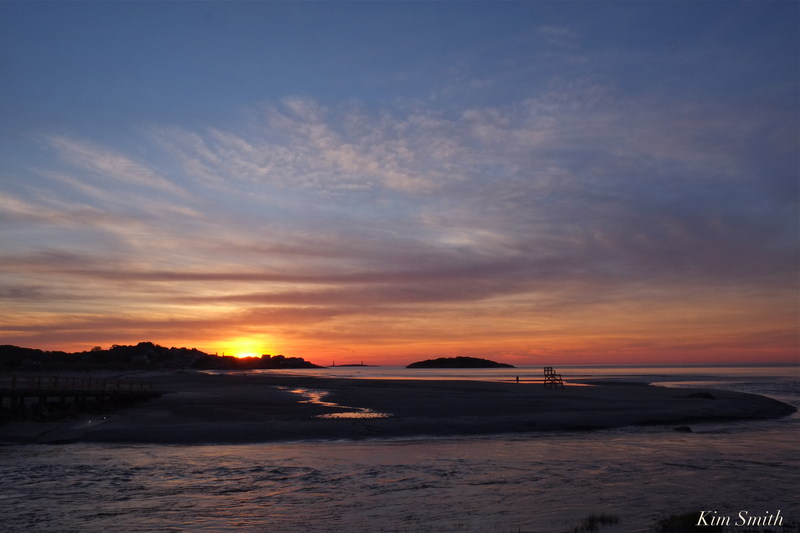 A friend from North Carolina shared that the beaches in her community are pristine. How do you do it I asked? Two simple solutions. Number one is barrels and number two is enforcing littering laws. 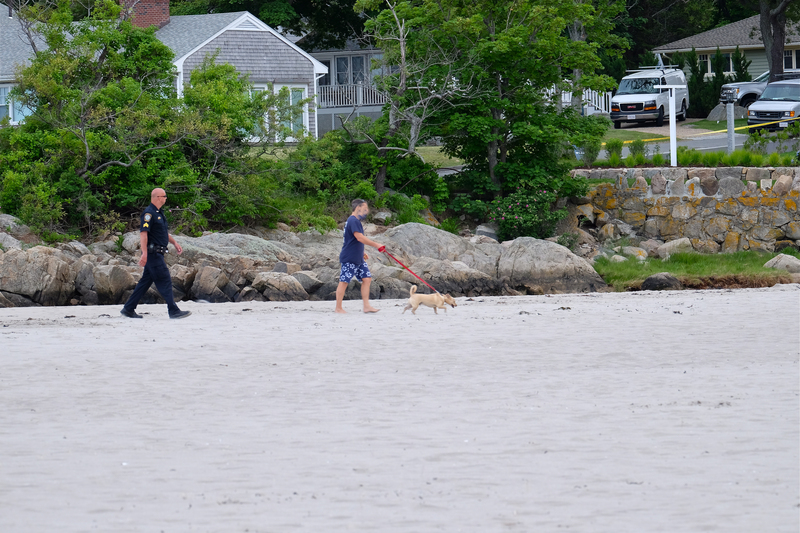 Every few weeks, police patrol the beaches and hand out fines for littering. After a few weeks or so, people become lax about littering, and out come the police handing out another round of fines. Would this be a money-maker for the City of Gloucester I wonder? 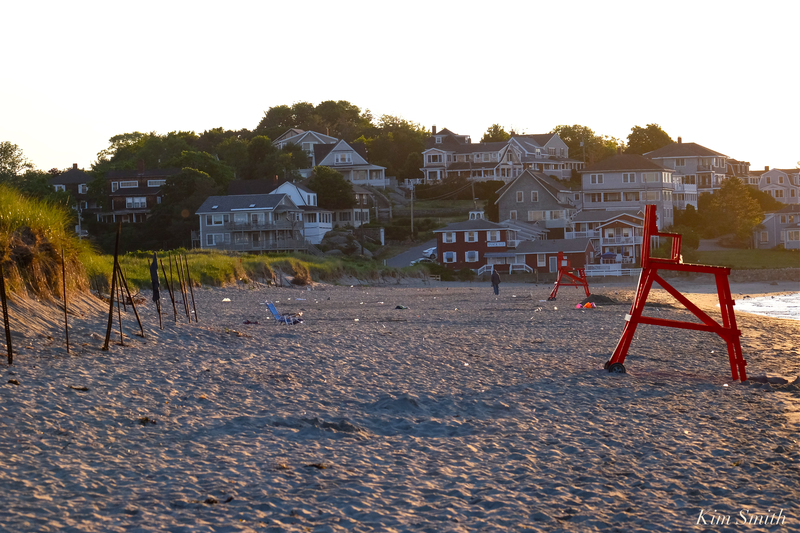 Plastic glistening in the morning sun – Good Harbor Beach, before the DPW arrives. 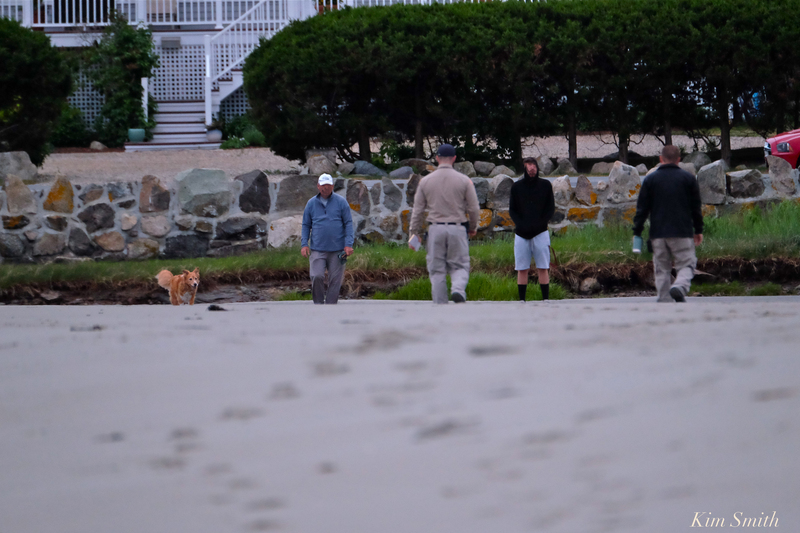 Dogs off leash at Good Harbor Beach continue to frustrate us all. 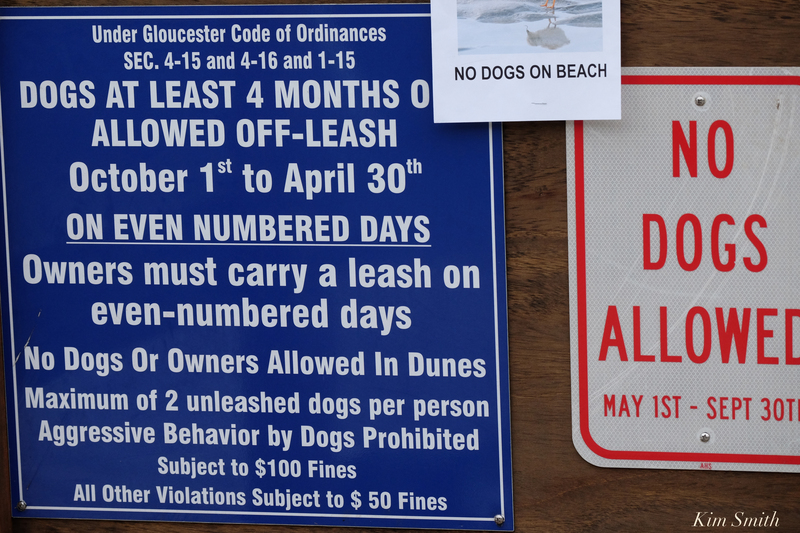 Despite stepped up enforcement, local residents and out-of-towners continue to flaunt the rules and the No Dogs signs. 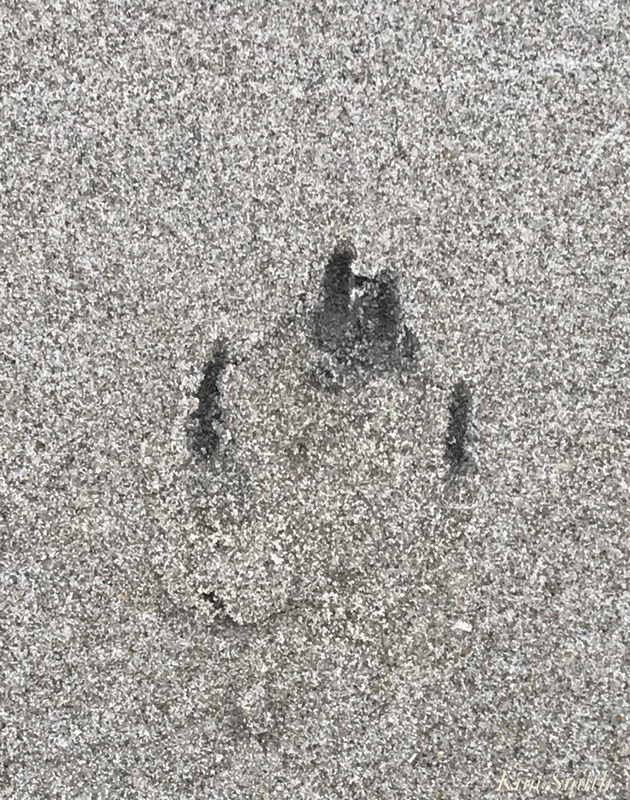 Every single day, we monitors see dog owners with their dogs, and dog tracks, at Good Harbor Beach. 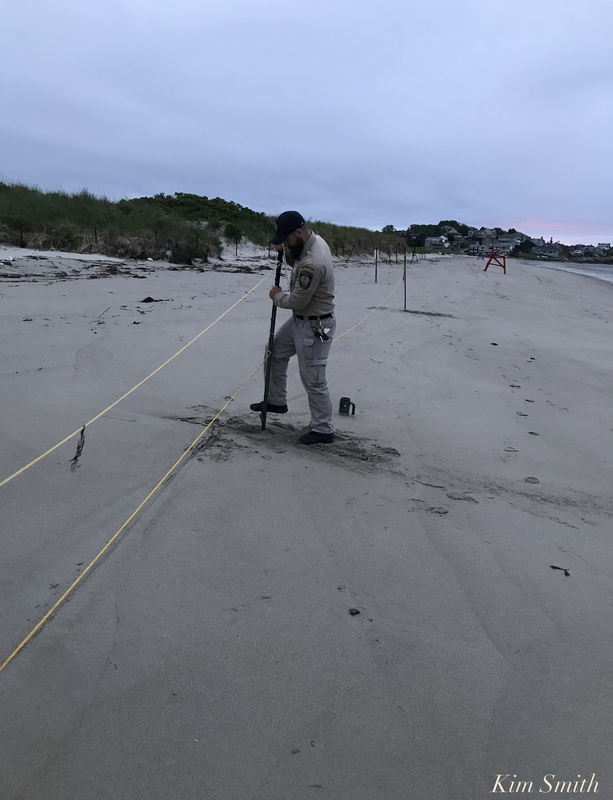 Dune fencing, which is slated to be replaced after the Piping Plovers leave, is going to help to keep the dogs (and people) out of the dunes. I hope well placed signs that speak to the fragility of the dunes will also accompany the new fencing. 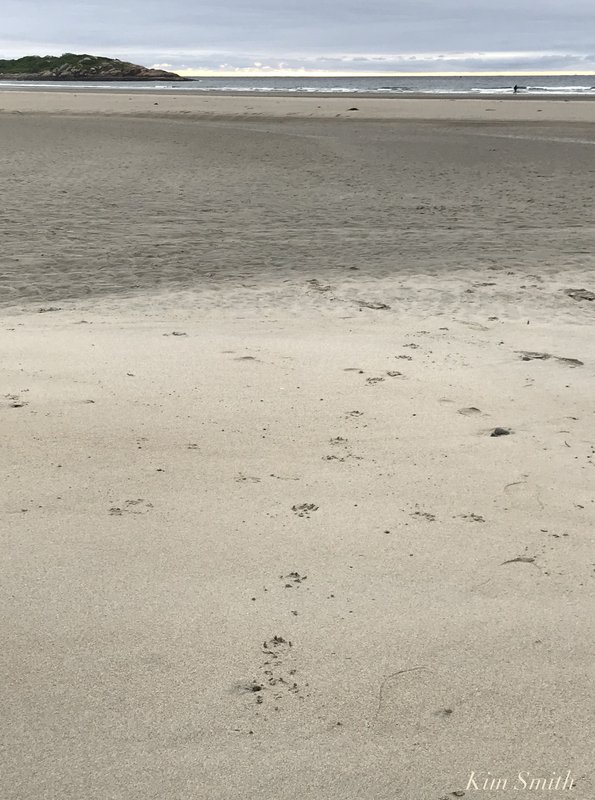 If you can imagine, people allow their dogs to run freely through the dunes and also use the dunes as their personal bathroom. Sometimes the scofflaws don’t even bother to climb the dunes, but run right through the nesting area and stand in broad daylight at the base of the dunes, in full view of all, to relieve themselves. 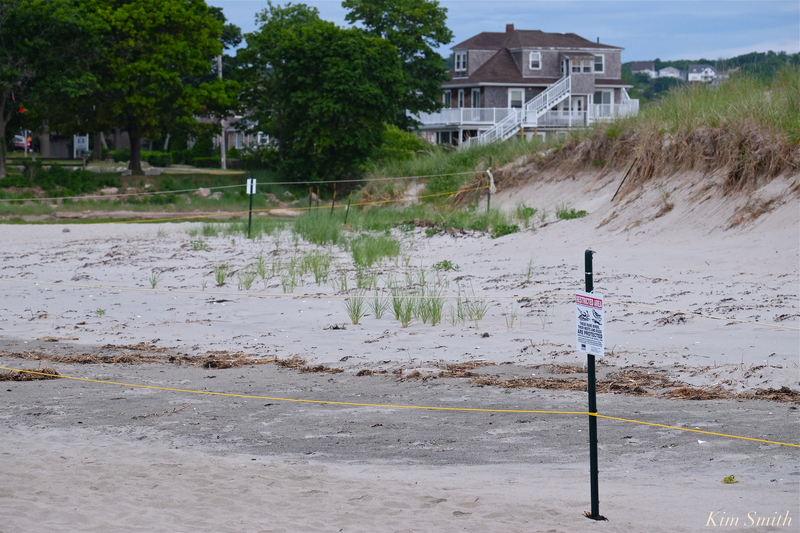 Note the beach grass growing at the base of the dunes where the roping has been in place since mid-April. I hope this area continues to be roped off, even after the PiPls depart. Growing sturdy patches of dune grass will help tremendously with the ever increasing problem of beach erosion. 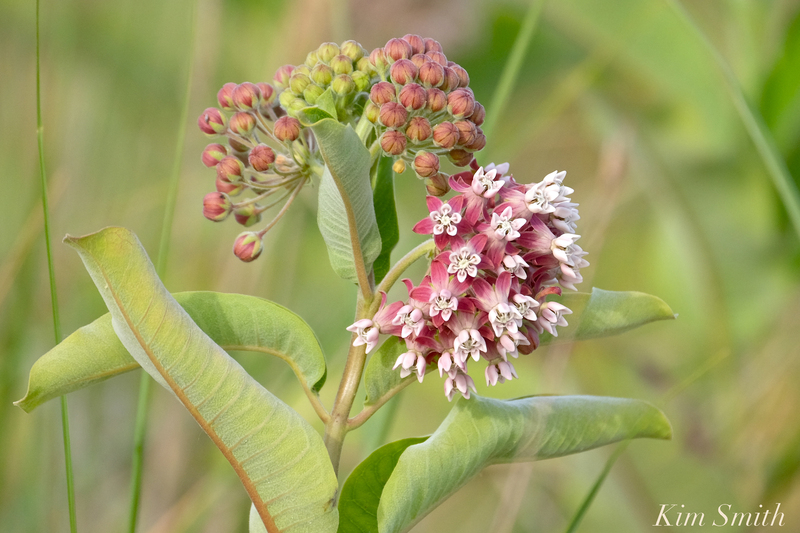 Common Milkweed (Asclepias syriaca) is coming into bloom at the Good Harbor Beach dunes. The many species of wildflowers found growing in the dunes provides myriad species of wildlife with both food and shelter. 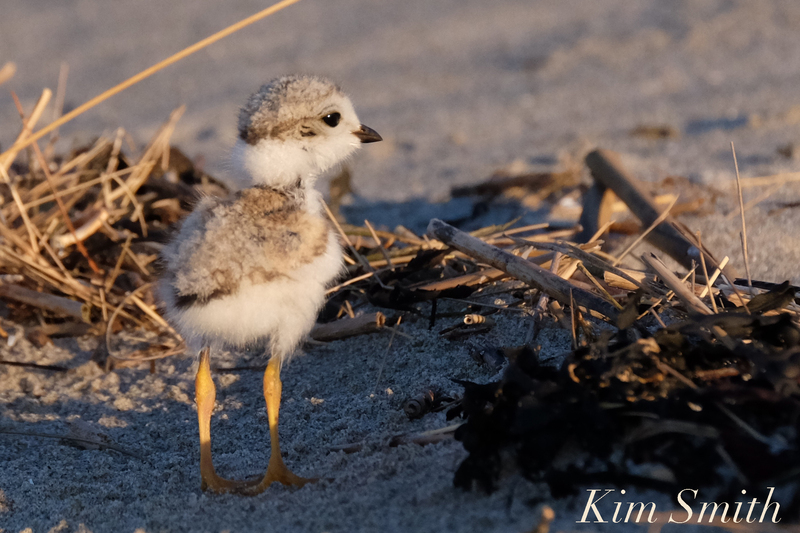 This entry was posted in Birds, Birds of New England, Cape Ann Wildlife, Gloucester Plover, Good Harbor Beach, Piping Plover and tagged #SavetheShore, #shorebirdsgoingextinct, 12 day old piping plover chick, 13 day old piping plover chick, 15 day old piping plover chick, Beautiful Birds of Cape Ann, Charadrius melodus, Gloucester, Gloucester Plover, Gloucester Plovers, Good Harbor Beach, how you can help the plovers, kwhittaker@gloucester-ma.gov, parking lot plovers, Piping Plover on June 25, 2018 by Kim Smith. 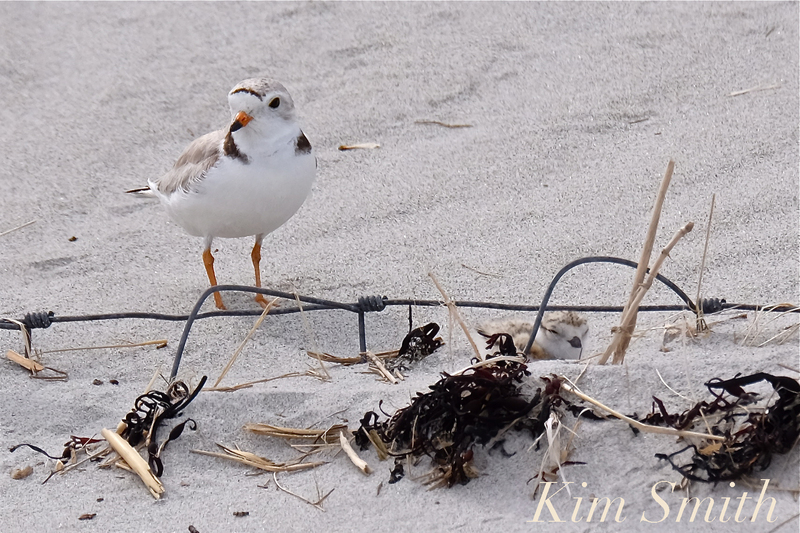 “What do Piping Plovers eat, especially the chicks?” is one of the questions most frequently asked of our volunteer monitors. 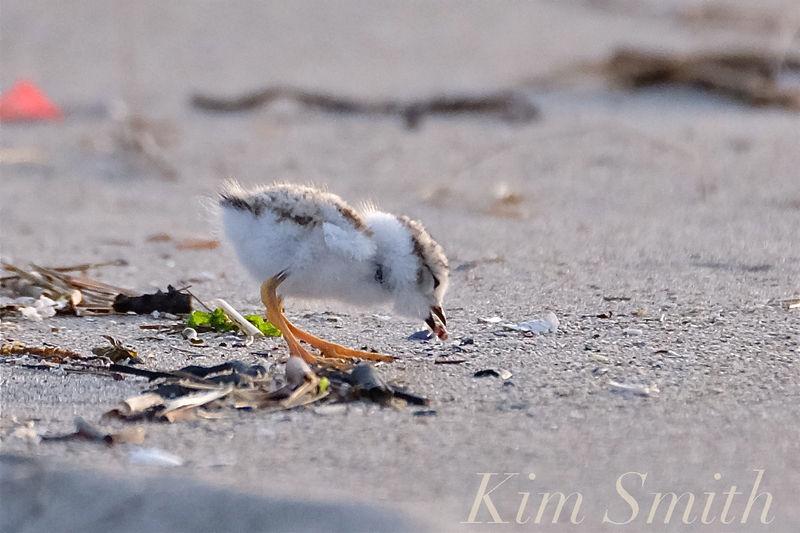 Piping Plover chicks eat everything the adults eat, only in smaller bites, and pretty much anything they can catch. We’ll often see the chicks pecking repeatedly in one spot. Unlike Mama and Papa PiPl, they don’t always eat the insect in one swallow. The chick will chase after the insect and eat it in several beakfulls. 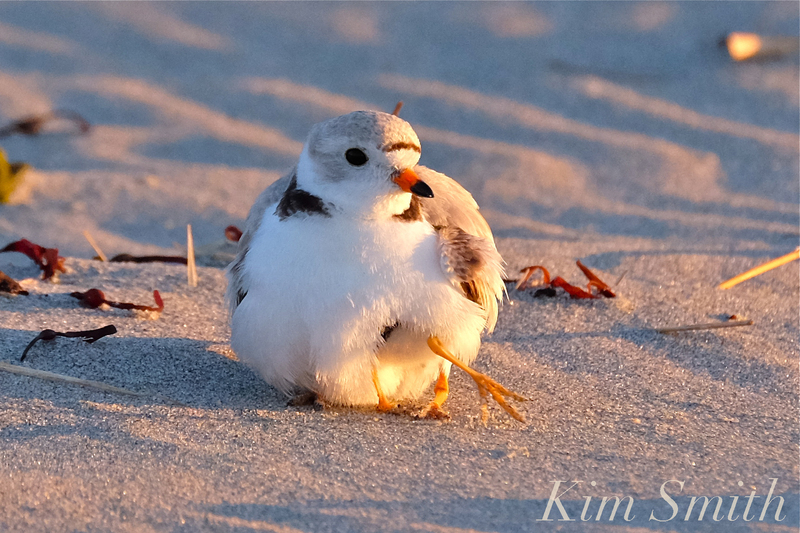 Piping Plovers forage at the shoreline, in the intertidal zone, and at mud and sand flats. While running, they scan the immediate area, and then peck at the prey it locates. 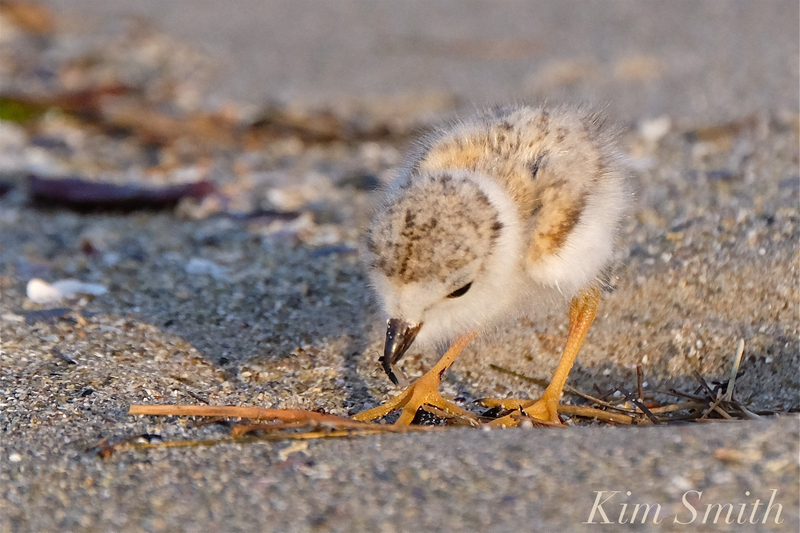 When by the water’s edge and in the sand flats, they eat sea worms, tiny crustaceans, and mollusks. When around the wrack line, they find teeny insects including spiders, beetles, ants, and insect larvae. Here’s our little Pip at eight days old feeding on a winged insect. 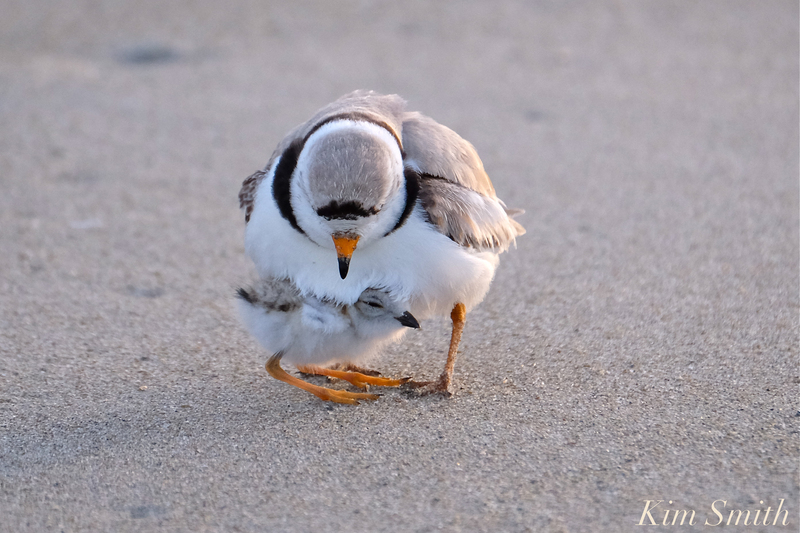 Piping Plover chicks begin pecking and looking for food within hours after hatching. 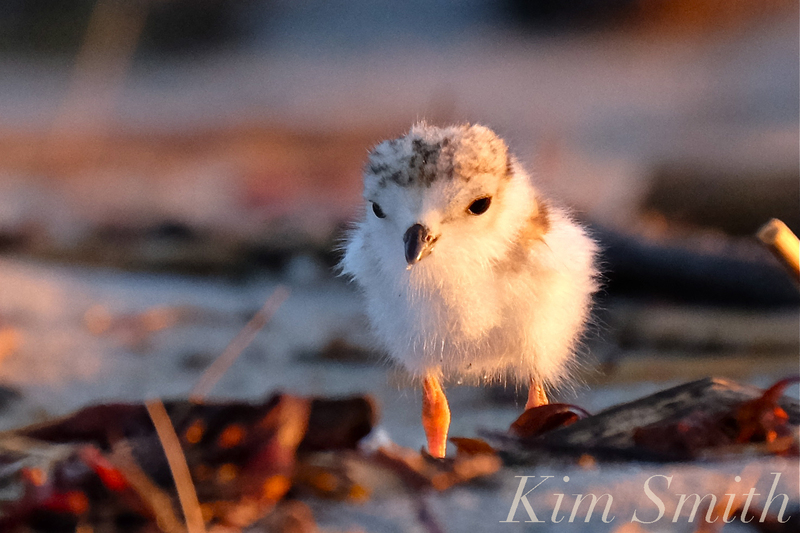 This entry was posted in Birds, Birds of New England, Good Harbor Beach, Life at the Edge of the Sea, Piping Plover and tagged #SavetheShore, #shorebirdsgoingextinct, Beautiful Birds of Cape Ann, Charadrius melodus, eight day old Piping Plover chick, Gloucester, Gloucester Plovers, Good Harbor Beach, how you can help the plovers, kwhittaker@gloucester-ma.gov, parking lot plovers, Piping Plover on June 19, 2018 by Kim Smith.